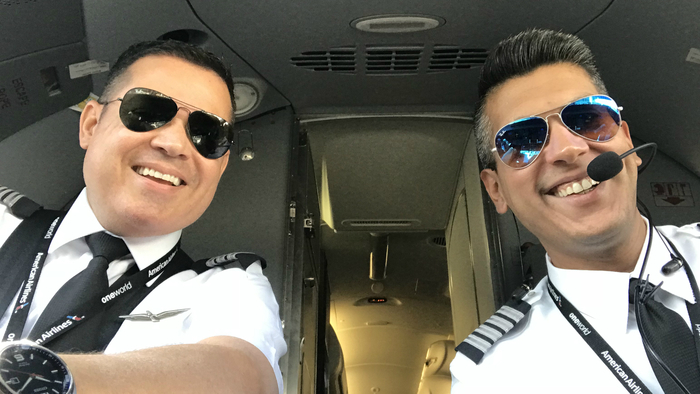 Cover Photo: First Officer Dean Valbuena (left) and Captain Ricardo Mata (right) on their first flight together. With about 16 thousand employees and a commitment to hire people from all walks of life, sometimes coincidental and serendipitous moments occur where one can say that we really do live in a small world. Take for instance, the Looney Cousins or the folks who discovered that both of their siblings worked together at NASA. Recently, another one of these chance happenstances took place at Terminal B at Dallas-Fort Worth International Airport between two pilots checking in to work a flight together. 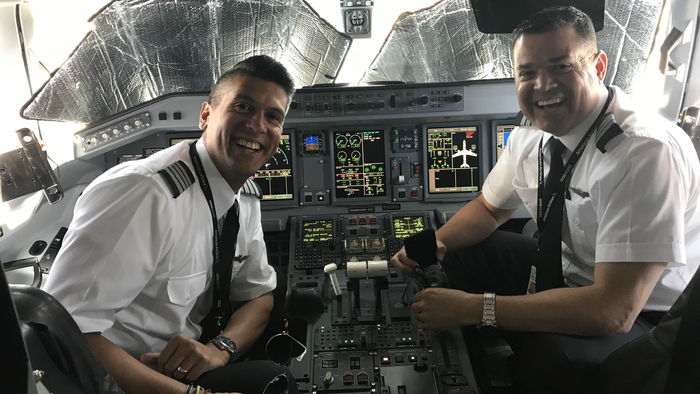 Much to their surprise, Captain Ricardo Mata and First Officer Dean Valbuena learned that they both hailed from adjacent small neighborhoods in Maracaibo, Venezuela. Below Dean and Ricardo recount that day, and reminisce on their childhood growing up in Venezuela. When and for how long did you live in Maracaibo, and when did you come to the U.S.? Ricardo: I was born and raised in Maracaibo, I lived there until I was 18 years old. I came to the U.S. in 1996. Dean: I came to the U.S. back in July 1993. I was only 22. Which neighborhood in Maracaibo did you grow up in? Ricardo: My grandmother lives in Dean’s neighborhood, El Naranjal, and I grew up in the next neighborhood, Villa Delicias. We literally grew up three blocks from each other! Describe what you remember about your old neighborhood – what was it like growing up there? Dean: My neighborhood gave me some of the best memories growing up. My high school was within walking distance – only five minutes away. Well, everything was close by, like the movie theater, restaurants, my grandma’s house, other family, and my friends. Ricardo: The best memory I have of El Naranjal is when I was like eight years old, and I wanted to do things on my own such as buying bread. We loved buying fresh made bread every day. So, I convinced my grandmother to let me go by myself. It was a two-block walk and my grandmother followed me from afar – I never told her I saw her following – but I remember using Dean’s apartments as a point of reference to turn right into the bakery. What are some of the things you two could talk about that no one else would know unless you came from that neighborhood? Dean: Maybe the Venezuelan food? Eating is my way of exercising. Ricardo: Well, that’s a long list. I call Maracaibo the Texas of Venezuela. We have our own accent, we dress like cowboys, we have – rather, used to have – cattle, farmland, and oil. We also have our own music and food. We pretty much have a separate culture from the rest of Venezuela. So we talked for two days about the food we miss, the people that are still down there, the school we went to, and the trouble we got in as kids. Dean: Always – I used to live on the south side of the Miami International Airport (MIA) near Runway 9, final approach. I would stare at planes from my bedroom all the time, or when going to the grocery store I would stop walking and stare at the planes coming in to land. I would buy pizza and bring them by the fence around MIA, and have dinner sitting on the hood of my car. Ricardo: Well for me, it was all I ever wanted to be in life! My dad is a pilot and my mom was a flight attendant, so I grew up running up and down the aisle of Boeing 727s in Venezuela. Where did you do most of your flight training, on what aircraft(s)? Dean: I worked out of Fort Lauderdale-Hollywood International Airport (FLL), working for a Part-135 operation servicing the Bahamas. Ninety-five percent of the flights were on the Cessna 402. Ricardo: I did most of it in Greensboro and Raleigh, North Carolina on Cessnas and Pipers. Why did you choose to come to Envoy? 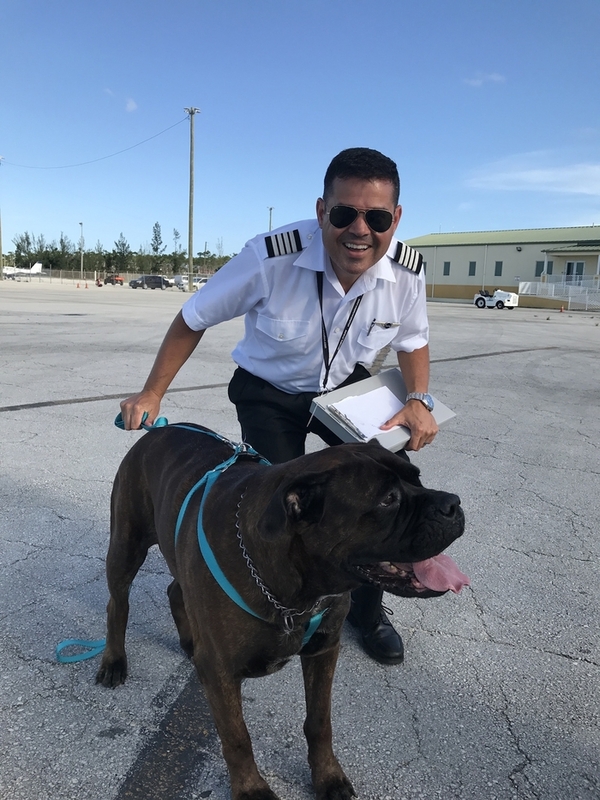 Dean: My commercial flight instructor and friend Ernesto Roman, who just upgraded to Captain for Envoy, took the time to explain all the benefits of working for an American Airlines Group company such as Envoy. It was no brainer. Ricardo: Growing up in Venezuela, where American Airlines has the biggest presence, I flew American over any other airline from the United States. Then, I moved to North Carolina when I was 18 years old, lived there for 23 years, and I flew a lot on American Eagle (now Envoy) to and from MIA. Describe the conversation leading up to the coincidence. What did you say and do when you found out? Dean: Well, I was near our departure gate at DFW, and I saw a Captain at the counter looking at his iPad. I approached him, introduced myself, and our accents gave it away. After that moment, it was non-stop talking about our experiences in this country. Ricardo: I was at the gate reviewing the flight plan when we met; as soon as he talked I knew he was from Venezuela. When he said he was from Maracaibo, we just hugged. As a First Officer I had flown with Captains from Venezuela, but never from Maracaibo. This was the first time I had flown with anybody from Venezuela as a Captain. Are you looking forward to flying with each other again? Staying in touch? Dean: Definitely – we had a good time working together. We talked about a concert and a birthday party, so I’ll see if I can get a weekend off work to go celebrate Ricardo’s birthday. Ricardo: Absolutely – we still have so much more to catch up on. I hope he can make it to my 40th birthday party.